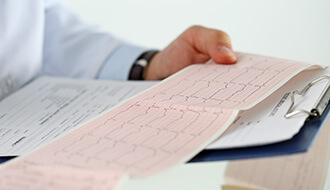 If your symptoms are only occurring occasionally, and are not able to be monitored during a routine heart exam or simple electrocardiogram, our specialists may recommend that you have a seven-day ECG. 1-week ECG (also known as an ambulatory electrocardiogram) allows your heartbeat to be monitored over the period of a whole week. This test will show how your heart responds to rest and activity, stress, and changes in medication. It is usually recommended by a specialist when your symptoms include dizziness, shortness of breath, chest pain (angina), fainting spells or blackouts (syncope or pre-syncope). For an ambulatory electrocardiogram, you will wear a small device, either around your neck or attached to your clothing at the waist, which picks up and records the electrical signals of your heartbeat. The device is attached to sensors which are stuck onto the skin of your chest. It is important that you do not get the monitor wet, so we will show you how to remove and reattach the device so that you can bathe or shower. We will ask you to keep an events diary for the time you are wearing the ECG monitor, which will help us to get an accurate reading of your results. Once seven days have passed, you will come back to the clinic to return the device and have your results collected and evaluated by our cardiologists. If you are experiencing any symptoms of potential heart disease, would like to discuss an existing diagnosis, or have any questions at all about your heart health, please come in to speak to one of our cardiologists. Give us a call to book to get your heart problem diagnosed. Even if your chest discomfort is only minor, or resolves quickly, it is still recommended that you make an appointment to see a doctor to assess the situation and find the cause. Some non-emergency causes of chest pain include gastro-oesophageal reflux disease (GORD), bone, muscle, or lung problems, anxiety, and panic attacks. Do I have to carry a special device around? Not exactly. The monitor consists of small sensors which are stuck onto your chest, and then attached to a device that either hangs around your neck or is attached to your clothing near your waist. You will have to make sure to keep the device dry, but other than that it is not difficult to wear. Why do I need to keep an events diary whilst I am being monitored? The events diary allows your doctor to coordinate your results with any periods of activity, in order to understand whether your symptoms happen at rest or during exertion. This information is important in getting you a firm diagnosis.